Following a rather unsettled practice week at the 2017 Isle of Man TT races, where the weather did its best to disrupt the proceedings. With three practice nights lost, The Clerk of the course, Gary Thompson made the wise decision to postpone the Opening RST Superbike race to Sunday, and use Saturday for more much needed practice and track time. With lack of track time, it was inevitable that lap records were likely to remain unbroken. 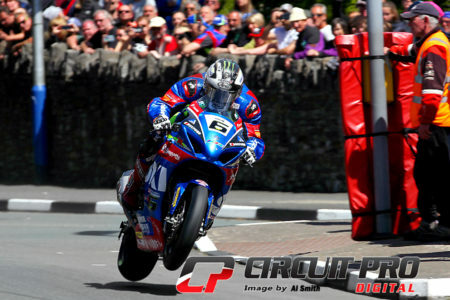 After a slow opening sector, Michael Dunlop on the Bennetts Suzuki was the leader at the end of the opening lap, with a lap of 131.135mph,. There was also bitter disappointment for race fans as Guy Martins much hyped return to the island, came to rather an abrupt end on the opening lap, when the Honda rider crashed at Dorans bend, Martin was lucky to escape with a bruised wrist, stating that his machine had found a box full of neutrals! Back to Dunlop, and his lead was short lived when he was reported retired at Handleys corner, thus allowing Dean Harrison to take the lead from Peter Hickman and Ian Hutchinson. Hutchinson turned the tables by lap three to inherit the lead from Harrison, but the Kawasaki rider retaliated and moved ahead on sectors of the circuit that favoured him more..
At the end of lap 4, and the final pit stops playing a crucial role in the TT races, it’s fair to say that the TYCO BMW pit crew had the art down to a tee, and this certainly gave Hutchinson a bit of breathing space. 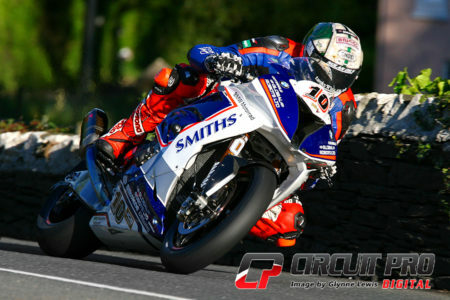 Hickman was now the man on the charge, edging ahead of Harrison and hunting down the race leader Hutchinson.. If that wasn’t enough to bring an exciting race for the spectators who had eagerly waited so long for the action to start, James Hillier was also on a charge and edged his way past Hickman! At the end of lap 5, Hutchinson had regained control of the race, but Hickman was looking menacing!, at Ramsay Hairpin on the final lap, Roy Moore reported that there was only 1.64 seconds between Hutchy and Hickman, but the Bingley Bullet got a better run over the mountain, as Hickman got held up by later starting riders. After crossing the line to win his 15th TT, the TYCO BMW rider was somewhat surprised to have won, in what he called a “rather strange race! It’s been the strangest practice week ever and we’ve all struggled for laps so seeing P4 on my first pit board wasn’t the ideal start,” quipped the jubilant Hutchinson. 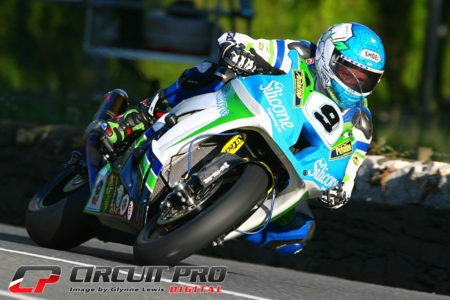 Hutchinson’s superbike win was the Temple Auto Salvage team’s first Superbike race win since Cameron Donald won in 2008! Peter Hickman was over the moon with his second place, which was to be his first podium at the TT, whilst in third place man Harrison was just so chuffed to be on the podium. 4th place man, Hiller rued his slow refuelling stop at the end of the second lap, costing him valuable time, 5th place went to Dan Kneen who suffered a 30 second penalty for a pit lane infringement, just getting the better of a race long duel with Michael Rutter who finished 6th. Best of the Nortons was Davo Johnston in 7th ahead of his team mate Josh Brookes who was making a return to the TT races following a sabbatical last year. 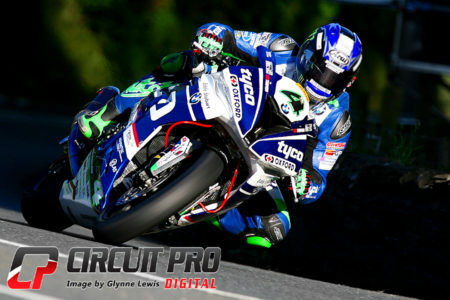 William Dunlop took 9th ahead of Martin Jessop. 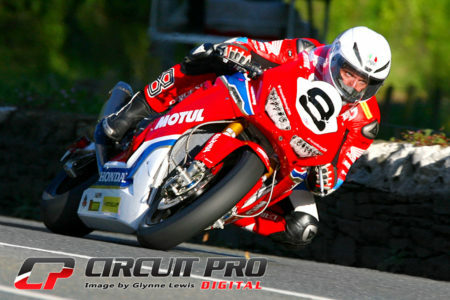 Conor Cummins and Bruce Anstey were both retirements, and despite his second lap retirement, Michael Dunlop set the fastest lap of the race! The scene was now set for the rest of the week with Michael Dunlop’s retirement and Hutchy’s win along with the youngsters taking podium positions; times appear to be changing for the up and coming young riders of today’s road racing.